As I mentioned in a previous post, I am currently in London, England, for the World Pride 2012 celebration which begins next week, and culminates in a parade on July 7th. 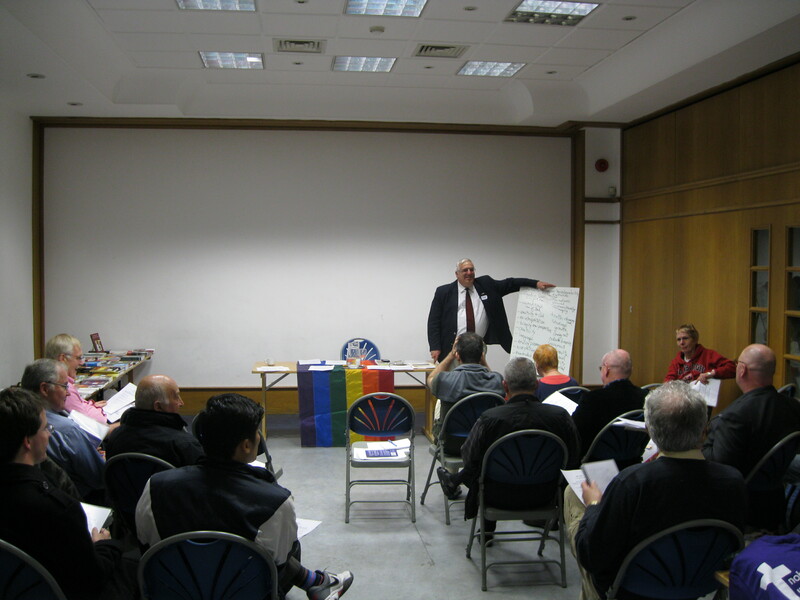 New Ways Ministry’s Francis DeBernardo conducting a “Next Steps” program in London, England. While visiting “this side of the pond,” I had the opportunity to conduct New Ways Ministry’s popular “Next Steps: Developing Catholic LGBT Ministry” program for a group in London. It was the first time that New Ways Ministry conducted this particular program in a non-U.S. setting. Over 20 people attended the day-long workshop (we also offer a weekend-long version of the program), which is designed to help people develop a plan of action (“next steps”) for LGBT ministry for their faith communities and/or themselves as individuals. The program was held agt St. Ann’s-in-the-City church, in the Soho area of London, on June 23rd. “The mustard seed has yet to grow to full maturity – but it has undeniably begun to sprout. –start a “speakers’ bureau” of LGBT Catholics and allies who can give presentations to parishes. England has long been a leader in the discussion of LGBT issues in the Catholic Church, thanks to some a dedicated group of lay people, priests, and some key hierarchical leaders who have been willing to address the issue. It was a privilege to work with some of those dedicated lay people and priests during the “Next Steps” program. Based on the intelligence, faith, and enthusiasm of the participants at this recent program, I predict even greater things will be happening in England on Catholic LGBT issues. For more information on the “Next Steps” program or to schedule one in your area, click here.